Prof. Lyn Evans, Director of the Linear Collider Collaboration (LCC), visited the Institute of High Energy Physics (IHEP) on June 9th. Accompanying him were Prof. Akira Yamamoto, the LCC Asian Regional Director, and Prof. Hitoshi Yamamoto, the LCC Associate Director for Physics and Detectors. The LCC delegation held a special symposium and participated in the LCC-China International Linear Collider collaboration meeting at IHEP. During the symposium, Prof. Evans introduced the LCC organization, which consists of both the Compact Linear Collider Study (CLIC) and International Linear Collider (ILC) projects. The LCC aims to coordinate research and development work for the world’s next big collider, and to come to a decision as to whether and where it should be built. He outlined the LCC international collaboration structure and the organization and personnel of the ILC accelerator division. Hitoshi Yamamoto reported the possible future physics discoveries at ILC and the technological development of the cutting-edge detectors required. Akira Yamamoto elaborated on the research progress of the key ILC accelerator technologies and the preparatory work for the international construction of the machine. In the afternoon, the LCC delegation held an in-depth discussion with Chinese physicists from IHEP and various universities. A broad consensus was reached on China’s role in the ILC project, including how China is going to participate, what China is going to contribute and who is going to join the project. After the meeting, the delegation visited the ILC 1.3 GHz superconducting accelerator module which is being assembled at IHEP. 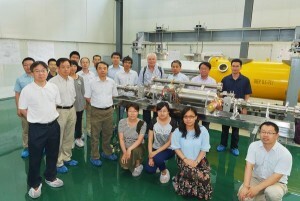 Prof. Evans expressed appreciation for the contribution China has made to the superconducting accelerator technology for the ILC, and encouraged the ILC team at IHEP to play a bigger role in the future ILC collaboration. At the end of their visit, Prof. Zhan Wenlong, Vice-President of the Chinese Academy of Sciences, met with Prof. Evans and his delegation. Prof. Evans introduced recent progress on the ILC project and expressed his hope that China would participate in the construction and future research programme of the ILC. Prof. Zhan then outlined current ideas for the development of high energy physics in China and the Chinese government’s positive attitude towards participation in major international scientific collaborations. Lyn Evans is a former Project Manager for the LHC at CERN. In June 2012, he was appointed the new Linear Collider Director by the International Committee for Future Accelerators. This story first appeared on the IHEP website.